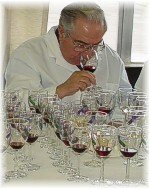 Gerald Cresci has been a long time judge of the Cloverdale Citrus Fair Competition before the renaming of the competition to the San Francisco Chronicle Wine Competition. Gerald was a long time coordinator of the Best of County Wine Sweepstake Winners at the California State Fair Exposition in Sacramento. Gerald resides in the Central Valley where he produces wine grapes.